Rich in calcium and omega-3. The finest quality fish, captured fresh in the wild and packed the very same day. Sardines are chock-full of important nutrients, such as heart-healthy omega-3 fatty acids (1g per serving), protein, and calcium. 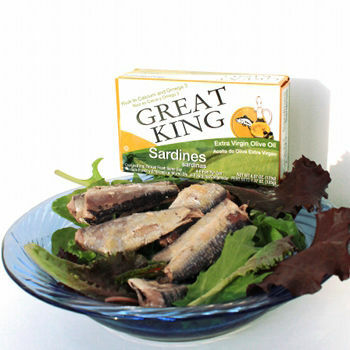 Sardines are also rich in phosphorus, iron, potassium, vitamin B6, and niacin. As mercury levels continue to rise in our rivers, lakes, and oceans, it's no surprise that an increasing number of health officials are sounding the alarm. While extremely dangerous for developing fetuses, babies, and small children, mercury poisoning in adults may cause brain damage, kidney malfunction, circulatory failure, and a variety of other ailments, including fatigue, numbness, irritability, and loss of controlled muscular movement. Methylmercury, a highly toxic form of mercury stored in the tissue of fish and other animals, attacks the nervous system and kidneys. Worse yet, methylmercury does not decrease naturally over time but biomagnifies up the food chain. In other words, when a carnivorous fish devours the flesh of another fish, its degree of contamination increases exponentially according to the amount of mercury contained within every fish the consumed fish has already eaten. The EPA warns that long-lived and large predatory fish may have mercury concentrations 1 to 10 million times higher than concentrations in water alone. Unlike herring, bristling, and other small soft-boned fish commonly marketed in the U.S. as 'sardines," these new sardines from Selina Naturally™ are true sardines, harvested in the Philippines. This tiny species of fish eats mainly krill and plankton, thus avoiding the concentration of mercury contamination encountered when you eat larger predatory fish. Sardines also live relatively short lives, making them unlikely candidates for absorbing large amounts of mercury from their environment. Don’t let their size fool you; these little fish pack quite the nutritional wallop! With heart-healthy omega-3's, energizing B-12, and the amazing cellular maintenance of CoQ10, the health benefits from sardines inarguably outweigh any chance, however minute, of mercury consumption. 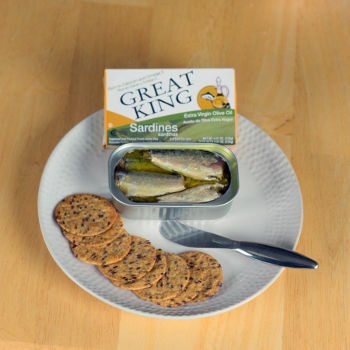 These sardines are lightly smoked and packed in extra virgin olive oil, within hours of their initial catch.